This pair of brothers are effectively reaching customers thanks to the clever name of their business. Meet this inventive pair and learn how they’re helping customers to vacation in high style. Then the late Robert Franklin established Winnebago Motor Homes in Rockford in 1967, the recreational vehicle (RV) lifestyle was catching on among trailblazing Americans who yearned to explore their vast homeland in comfort. For $6,900, they could purchase a 19-foot self-contained unit and roam U.S. highways coast to coast, staying wherever they chose, for as long as they chose, with no motel or airline reservations required. As the yearning for this lifestyle grew, so did Winnebago Industries, the pioneering RV maker headquartered in Forest City, Iowa. It achieved its first $1 million year in 1961, and its first $1 million day in 1968. By the late ’60s, its workforce had grown from 17 to 1,252, and 140 motor homes were rolling off the lines each week. It’s not hard to understand why forward-thinking Franklin opened a dealership on the property of his family home at 6841 Auburn St., Rockford. It was a decision that would impact his family for at least the next three generations. But after joining their dad’s business in 1970, Terry and Don Franklin quickly learned just how vulnerable the RV business is to factors beyond their control. The ’70s brought an oil embargo, climbing gas prices and a sputtering economy. RV sales slowed. Then RV sales rebounded. Thus began a roller coaster ride the brothers have ridden for more than 30 years. Today, their enduring success speaks for itself; the dealership is one of the oldest and most respected of its kind. Along with selling new and used Winnebago and Itasca RVs, the Franklin brothers service RVs of all makes. They serve customers around the nation and have even shipped a few RVs overseas. Because an RV is a big-ticket item, buyers tend to do exhaustive research on price. Richard and Carol Doose, of Lake Summerset, in Davis, Ill., are no exception. Seasoned veterans of the RV lifestyle, the couple knew exactly what they wanted and how much it should cost, when they decided to trade in their old RV in 2006. “We shopped around home, including at Winnebago Motor Homes, then shopped all the way to Florida and back,” Doose recalls. “When we got home, we traded in our older RV for a new 36-foot Winnebago Tour from Winnebago Motor Homes, and we have no regrets. The Franklins are the nicest people you could ever meet. And Terry’s son, Mick Franklin, always goes out of his way to make sure we’re completely happy with our experience in the service department.” Doose frequently refers friends with motor homes of all brands to the Franklins for service. “You never feel like the Franklins are trying to snow you,” he says. The Dooses chose a 36-foot RV over longer models because they love staying at national parks. Many park facilities were built during the Great Depression and can’t accommodate RVs longer than 36 feet. Before cold weather sets in each year, the couple heads for warmer climes. They have a tradition of taking each grandchild on an RV excursion when he or she becomes a teenager. Although it’s not inexpensive to keep their diesel-powered RV on the road – it gets about 7.5 miles to the gallon – Doose notes that RV parks average $15 to $20 per night, compared to $60 to $150 per night for motels. The couple enjoys the convenience of packing just once, the freedom to wander back roads on a whim, and the ability to cook their own food. The Dooses pull a Buick Enclave behind their RV. “With the car behind us, that’s 35,000 pounds pushing down the road, but motor homes really are not difficult to drive.” After pulling into a park, RV setup takes Doose just 30 to 45 minutes. The Franklins enjoy hearing travel stories from customers like the Dooses. 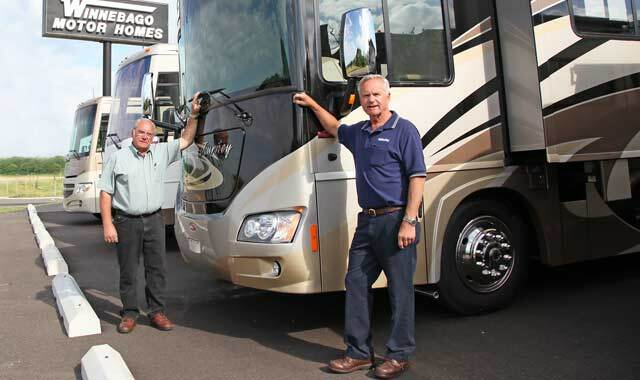 Most are retired, but some younger families appreciate the advantages of RV travel, too. The Franklins sell both Winnebago and Itasca RVs because their dealership predates Winnebago Industries’ mandate to choose one brand or the other. Both are manufactured at the same Iowa plant, “but the Itascas are a little more dolled up,” says Terry. “It’s similar to the difference between Pontiac and Chevrolet.” Chassis for both brands are made by Mercedes-Benz, Ford or Freightliner, depending on the size and model. More expensive is the elegant 42-foot Itasca Ellipse, with its solid cherry wood interior, fireplace, leather sectional sofa, Euro recliner, king-sized Sleep Number bed, porcelain tile flooring, two bathrooms and three large LCD flat-screen TVs, one embedded into an exterior wall for outdoor viewing around the campfire. Such units offer a variety of floor plans and options. The Franklins attribute their success to several things, but none are as important as providing excellent customer service. The Franklins employ 10 full-time and two part-time people.Terry’s older son, Scott, ran the parts department for several years until he was taken ill with ALS. “He has been greatly missed by us as well as by many customers,” says Terry, whose other son, Mick, now manages both the service and parts departments. Terry’s wife, Melanie, and Don’s wife, Angie, work in the parts department, too. Scott’s 16-year-old son Derek came aboard this year, marking the fourth generation in this family business. Forest City, Iowa is located in Winnebago County, Iowa, a factor that helped the Franklins immensely when the Internet age dawned. “Thankfully, our dad named this dealership after Winnebago County,” says Terry. “When people type in WinnebagoMotorHomes.com, our dealership pops up first. That’s really helped us, no doubt about it. People really enjoy sitting at home browsing photos of our units on the Internet. This entry was posted on Thursday, July 26th, 2012 at 11:57 am	and is filed under Northwest Business Magazine. You can follow any responses to this entry through the RSS 2.0 feed. Both comments and pings are currently closed.